Ever since I started growing vegetable in my container garden, flowers and ornamental plants took a back seat. And everytime I visit garden stores, I end up buying lots of flower seed packets and realize that I dont have enough containers to plant them. But now I got some more new containers/pots. So its party time!!.. My hands started itching to sow some flower seeds. Last sunday, the sowing finally happened. 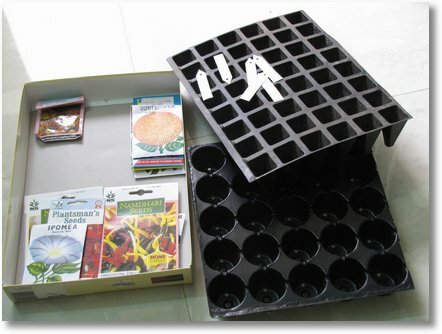 Seed packets on the left and cell trays on the right side with plant labels on the top. Labels are DIY types. If you watch closely the seed packet on the right is Ornamental Chillies. I have been wanting to grow these since ages and finally got it a week back. These cavity trays will be filled with seed starting mix. Seeds with the seed starting mix. The seed starting mix is 3:1 peat + perlite. It has no fertilizer and hence will not burn the seedlings. Once the seedlings have their true leaves I water them with a weak solution of fertilizer. Sowing is different for different flowers. For Marigold, the seeds need to be covered but coleus needs light to germinate. Care has to be taken. Spending time on reading the seedpacket will do good. The red tray that holds the mix is from a local plastic recycle shop for Rs 30 and its such a useful item in my garden that too at a dead cheap price. and now the most difficult job…. waiting for them to germinate..
Will keep you all posted about the progress. There are more seeds to sow.. May be someother day! Looks like you’ll have plenty of nice things for your garden! Hi gg, I see you have ipomoeas seeds and wanted to ask you a quick question on them. Should you pinch ipomoeas to make them bushier/control growth ?. Mine just seem to grow vertically and cling on to anything it can get its vines on. If you should pinch them, then how do you do it ? The terminal nodes for these are the vines themselves unlike other normal plants. Could you help me please ? This is actually my second time sowing ipomoeas. The first one I had was attacked by fungus and had to remove it. Ipomoea is a climber and it will just try to spread over any support that it can cling to. Occasional pinching of tip will encourage bushiness. You can just nip the tip of the emerging shoot that is the tip of the vine. In the one I had there were so many side shoots that were popping up even without pinching the tip. I have a question for you too. The one you have has a tri-lobed leaf? Because I have noticed two different varieties. One with normal leaf and the other with tri-lobed ( has very big flowers). This is my second attempt at growing ipomoeas too. The first set was attacked by aphids. But this time i’m armed with Panchagavya i got from greenlands, chennai. I bought these seedswhich costs around 30rs/packet. Will post a pic of the new one when i get home. Waiting for new pics :). What soil you use for your containers?. You are right. The one I have now is definitely a three lobed one and looks exactly like the one in that pic. It looks different from the one i had before. I see a flower bud now coming up. Will post a pic when it is in bloom. I’m surprised that you didnt have luck with your Ipomoeas. The only reason i can think of is the quality of the seeds. The one you have looks like what i usually see in lalbagh. They cost around 5rs a packet if i am not wrong. I have never had any luck with these or the ones from Indham either. So i switched over to namdhari seeds. The downside is, i find propogating them difficult. I saved the seeds of the previous ipomoea, and tried growing them. while they grew well, they simply didnt bloom at all. You are really going to enjoy looking at those flowers I tell you. I think you are right about the quality of the seeds. I switched to Namdhari’s(NS) long back. Its just that I had these lying around for a while and thought I will sow them. I will try to get Ipomoea from NS. That 5 rs packet is what I had used. The germination was OK. But may be my soil was wrong or must have overwatered or something… I dont go with INDAM because they give too less seeds for the price you pay. I have found seed starting on a tray/pan helps you plan well and you can be assured of healthy plants getting into the big size pots. Cocopeat+perlite works very well for me so far. Thanks for all the info lokesh. I’m not sure if I am with you about the price. There’s a namdhari outlet right next to my house at Jayanagar 4th block. I bought quite a few seeds about 2 weeks back and am propogating this season..and they all cost the same 30rs. I would be very happy if thats the case. I went yesterday to NS in Banashankari and to my surprise all the seed packets are priced at Rs 41. So if your nearest NS sells at 30 then you should probably make your purchase soon before he increases it :). The pic quality is good enough to say its a trilobed one. This is grown from NS right?.Let me see if i can get one of these. The NS you are saying is in 4th ‘T’ block on the corner of the road?. Amazing pic of sunflower.. very nice. Flower gardening is always fun, ain’t it! Tithonia was a great choice. I love ’em too. Can’t wait for my seedlings to flower… LOL! I know I’m impatient. Regarding the aphids on Morning Glory, the Panchakavya wouldn’t help. Make sure that there aren’t any ants helping the aphids, because the ants make it all the more difficult to control. Spray the affected parts with a solution of 1 tablespoon of dishwashing solution in 4 litres of water. This basically destroys the pests that’re of sucking nature and also helps control mildew and spots too. This works as I had great results with them. Don’t wait with the aphids on the Morning Glory – they spread really fast and my 3 feet beauty succumbed to aphids because of my procrastination. I got some seeds from Mumbai in February – flower and vegetable seeds. These included seeds from Namdhari, Ratanshi, Pocha and Pyramid. I was a bit skeptical of Ratanshi’s carrot seeds, but almost 90% of them germinated. Have also planted Balsam, aster and marigold and they are all about 5 cm tall now. Will plant more Indian veggies soon as I harvest some and get some space. Nice to hear about all the plants and flowers you are growing in B’lore. I haven’t tried Ratanshi seeds. I know there were fertilizers from Ratanshi but they sell seeds too !!?. Good luck with your flower seedlings. Indian veggies are nice to grow esp when you are abroad.. “smells like home isn’t it?”. Can you please give me the address of Namdhari seeds that will be nearest to Silk Board. You can go to any Namdhari Fresh super market and they have a supply of seeds. There is one in Koramangala, Near the Games Village. Glad you liked it. 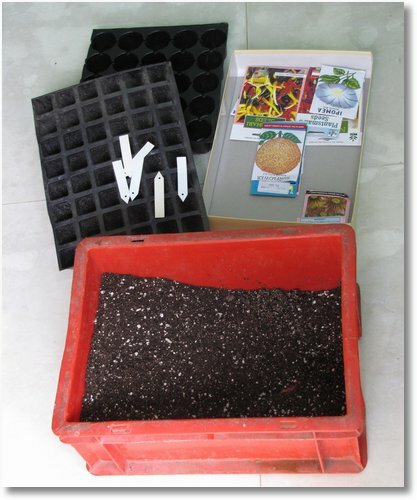 There are several other techniques in seed starting which i will detail in the coming posts. Hi, can i now where to get those cavity trays in Bangalore? i have sowed morning glory seeds a week back and now they are 2″ tall, i have sowed them in a normal clay pot but the tray looks more resourceful pls let me know where can i get this in Bangalore. These cavity trays are available in most of the garden shops. It is available in Gandhi Nagar near Majestic. I am Meena, we had met during the Organic Farming & Seminar at Lalbah some time back. I am an avid reader of your blog and have noted down the useful exerperiences you share with us. I am delighted to share with you that our terrace is ready for gardening. We have built permanent planter boxes around the parapet walls and I have been busy so far, buying soil and other stuff, as per your recommendations. I have a doubt on seed starting. 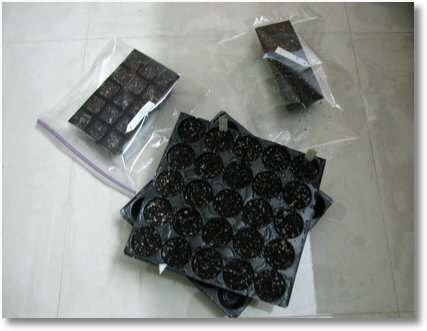 I was told to use only cocoapeat in trays, keep the tray in terrace (direct sunlight) , simply cover the tray with moist newspaper and I was told that the seeds will sprout in two days. I was also told to keep the plants in the same tray for 21 days , just do watering with plain water and then do the transplantation. Could I have your inputs here please? My doubts: Will cocoapeat alone suffice for 21 days? Can the tray be kept in direct sunlight from the start? You have mentioned that you water with a diluted fertilizer. Can you please give me the fertilizer details and in what proportion to dilute? I am excited as I have purchased lots of heirloom seeds from DOH. I will wait for your response and proceed accordingly. Thanks in advance. Your blog is wonderful and you are very kind in sharing lots of things ; novices like me find it a single point location to get detailed inforation and start with confidence. Good to hear from you after a long time and congrats for your all new terrace garden. Regarding your question, for seed starting, using only coco peat is fine. Not all seeds sprout in two days. Especially in the colder weather most of the seeds take more time than in summer.give it a weeks time. Keeping it in direct sun may not be a good idea for several reasons. the moist newspaper you cover it with will become dry in just minutes and water from the cocopeat evaporates too leaving dry media with the seeds. Also, if it rains the seeds might get dislodged. Its better to keep them in a bright location but not direct sunlight. For a seed to germinate, it doesn’t need any fertilizer. Hence, coco-peat is just fine. But once the seedlings have germinated, they need some nutrients along with good amount of sunlight. If you leave them in plain cocopeat for 21 days they might be little stunted. A week after germination, you can start watering them with dilute fertilizer. Regarding fertilizer, if you are totally organic then you can make compost tea and water the seedlings with them. There are plenty of material in the web on how to make compost tea. If you are ready of chemical fertilizers, then you can dissolve 1 gram of 19-19-19 in a litre of water and water the seedlings with that. Just a little warning about heirloom seeds from DOH. Offlate there are many complaints from my blog readers and other gardeners that the germination rate of DoH seeds are not upto the mark. I kinda agree with them. Don’t get disappointed. Just sow more seeds than what you want. Good luck with your adventure and keep us all posted with pics.. Thanks for the detailed response. No wonder, my first attempt in seed starting flopped! I used soil and compost (horse dung, a friend of mine said, based on the smell) and it must have been too much for the seedlings; they never developed true leves. I will follow your suggestions on seed starting and keep you updated. With DOH, I was refused vermi compost, inspite of my making calls to them before going there, and getting a confirmation too; they flatly refused to give me the no. of bags I had requested for. And this, despite the fact that they did have the compost! Perhaps, it was reserved for somebody influential! I am yet to try out the heirloom seeds got from DOH. Tried to access more info on Indian spinach because you have made it sound really tempting! Found no such site. Please check the name/spelling of bijlmakers. Thanks. It is really very easy and very rewarding to grow Indian Spinach… The timing is also right now, with the rain Gods blessing us. I totally agree with Meena. This is the time to grow almost any vegetabel. The rains make the greens look so much fresher and gives a good wash to all the plants in general. The forum is the best place to ask the question so that everyone will benefit from the discussion. A thirsty and hungry reader for info on kitchen gardening that I am, hv bn devouring every post of urs for the past 3 weeks. Reading, jotting down notes, re reading and it goes on. What a treasure trove u r website is. Amazingly awesome. hv got grt results with chillies with 100%germination and almost every plant starting to bear chillies. The Tomato plants too are almost 6″ tall and am very happy with them. However my 3 attempts at growing corrinader have miserably failed. methi(Fenugreek) and Palak are just abt struggling to stay alive. But the joy of seeing u r babies grow is indescribable. Thank u, thank u, thank u.
I want to know that do seeds damage after some time or we can use them again and again in many seasons. I wrote to you some times back seeking help and advice for starting kitchen gardening. You have not responded. I don’t know if you respond to unknown people. Please let me know if I can seek help from you. I stay in Mysore and would like to get some tips from you as I see you as a wonderful gardener and have put your heart and soul in it. Moreover I see you giving sincere tips to few of the people of your choice. Hope you will respond to me so that I can start my conversations with you. Looking forward for your response to my gmail id that I have provided. thanks a lot – Meera.